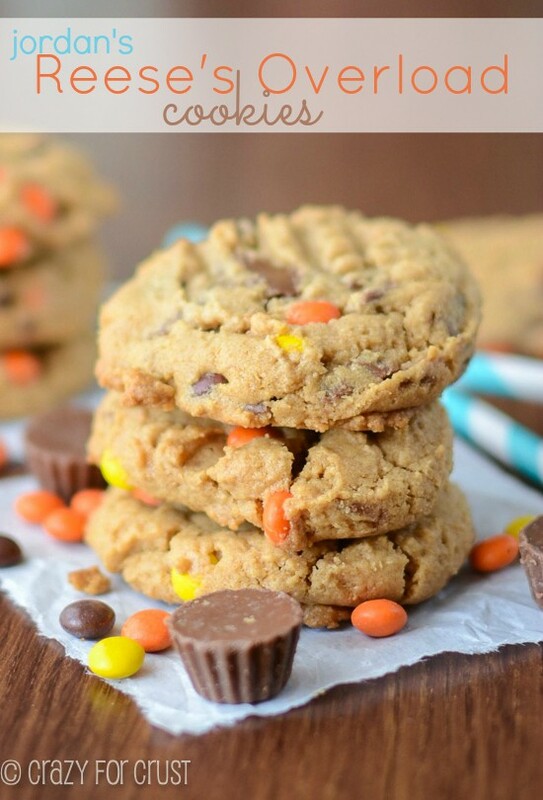 These Reese’s Overload Peanut Butter Cookies are the best peanut butter cookies ever. 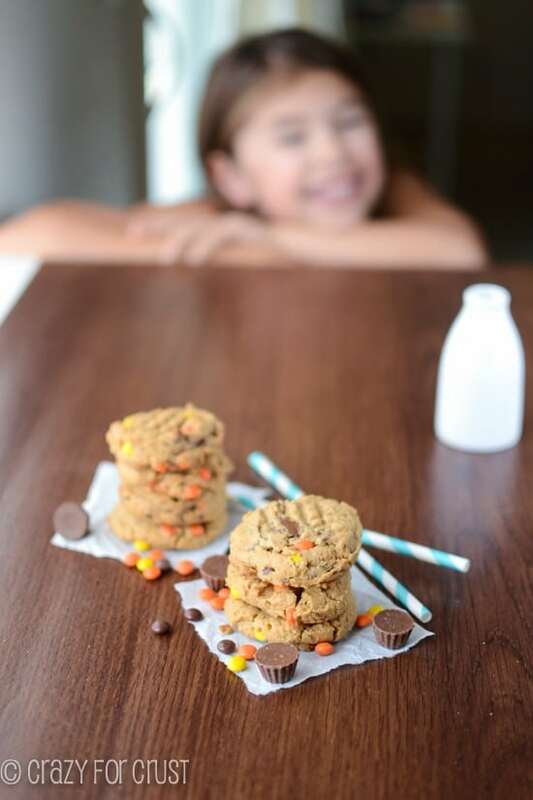 So simple, and just a few ingredients, accidentally gluten-free – even a kid can do it! Why yes, I am posting another peanut butter recipe. I strive for once a week. It’s not too much, I know it’s not, because y’all love them so much. That’s why we get along so well. Really, I could eat some version of a peanut butter dessert every single day. Which is funny, because I’m not a peanut butter sandwich gal, and if there is someone sneaking spoonfuls from the jar, it’s my husband, not me. During our marathon baking session a few weeks ago, Jordan wanted to make peanut butter cookies, with Reese’s. How could I say no? But I felt sort of weird just making peanut butter cookies. I mean, I have the best recipe already on the blog. Then I have this one, and this one, and these made with cookie dough. So, yeah. 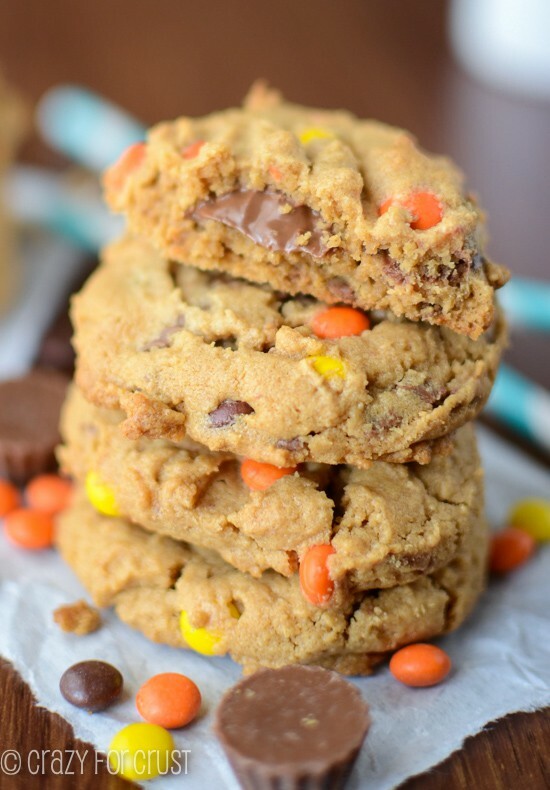 I’ve got lots of peanut butter cookie recipes. But how could I say no to this face? For this peanut butter cookie recipe, I decided to re-make one I did in the first year of the blog. It’s the easy peanut butter cookie recipe and I love it so much. There are so many variations around the internet. My friends Averie and Stephanie are two that have it. But it’s such a classic, I had to share it here again. Because, if you’ve never had them, they seriously are the BEST peanut butter cookies. Everyone raves about them. All the time. These are my go-to cookie recipe. Sure, I love a regular cookie recipe too. But these are so easy, you can have them in your mouth in less than 30 minutes, with only a couple dishes to wash.
Because there is no flour in these cookies, the peanut butter flavor comes through in a big way. Use a good peanut butter, one you’d eat with a spoon. My favorite peanut butter is Skippy Naturals. We go through one of the super-sized Walmart jars every week and it’s the perfect peanut butter for these cookies since it’s so peanut buttery. Use what you love! And then, well. 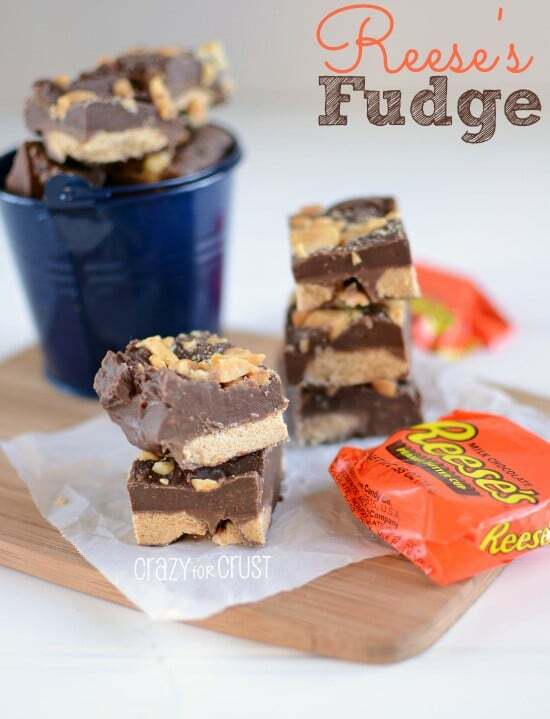 Add Reese’s Pieces and Reese’s Peanut Butter Cups. They’re exponentially better that way. These are the kind of cookie that, when you kids come home from school begging for cookies, you can say yes too because they’re so easy. They’re the kind of cookie your kid can make, with only minimal supervision. These are the cookies that Reese’s were made for! 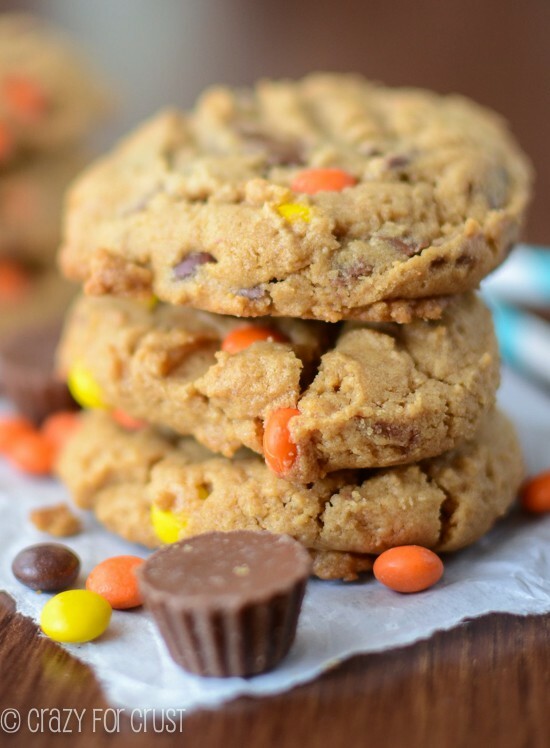 The ULTIMATE Reese's Cookies - easy peanut butter cookies FILLED with tons of Reese's peanut butter cups and Reese's Pieces! AND they're accidentally gluten-free! Mix peanut butter, egg, sugars, and baking soda in a large bowl. You can use a mixer, but it's easy to do by hand. Once incorporated, stir in Reese’s Pieces and peanut butter cups. Scoop balls of cookie dough onto your prepared cookie sheets. We used a 2 tablespoon cookie scoop for this step. Use the tines of a fork to gently flatten each cookie. Bake for 8 minutes. Cool before removing from cookie sheets. Note: these cookies can be crumbly so be careful when picking them up or packing them in lunches. Love EASY peanut butter cookies? 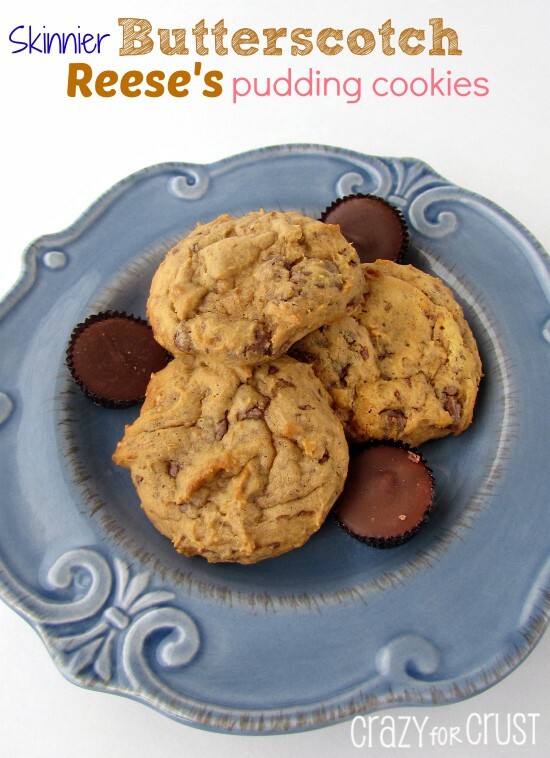 Be sure to check out my Gluten Free Monster Cookies, Peanut Butter Sprinkle Cookies, or Old Fashioned Peanut Butter Cookies by Barefeet in the Kitchen, Flourless Peanut Butter Cookies Four Ways by Cupcakes and Kale Chips, or Gooey Peanut Butter Cookies by TidyMom. oh these make my heart sing….THANK YOU! The other day I was looking for a recipe I know I saw when I was reading about the brownies. My hubby loves maple nut candies. I could have sworn I saw a recipe on your blog but was unable to get back to it for some strange reason. Maybe I wasn’t entering it correctly? I would def like to try that recipe. Hi Terrie! I bet you were thinking of the Maple Walnut Truffles. Here is the link! https://www.crazyforcrust.com/2013/09/maple-walnut-truffles/ Enjoy! Of all the cookies I have made in my lifetime…I haven’t really done peanutbutter (for no good reason); I made this batch a couple of hours ago and just tried one…O.M.G!! No need to look for any other recipe! These are the bomb! i was worried they wouldn’t hold together after reading your initial comments; but they are ok when moving them carefully. Will definitely be making them again. Thx for sharing!